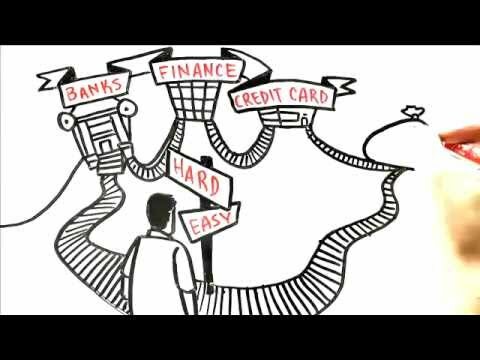 Watch this video and discover how to bypass banks and Wall Street altogether! If you’re like most people, you don’t have a clue what your retirement account will be worth on the day you plan to tap into it – but it doesn’t have to be that way! Hundreds of thousands of people have opted out of a system where the odds are stacked against you and are using the Bank On Yourself® method to achieve life-long financial independence and security. See how folks of all ages and incomes are using Bank On Yourself. 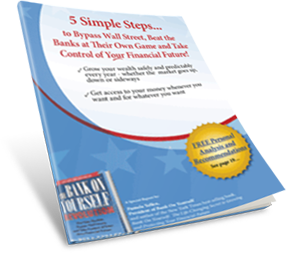 Bank On Yourself is a legitimate method that lets you bypass Wall Street, beat the banks at their own game and – finally – take control of your own financial future. It can help almost anyone – regardless of age, income or financial sophistication – reach their financial goals and dreams without losing sleep. However, if you spend more than you make, this is not for you. And if you’re looking for a get-rich-quick scheme, you will surely be disappointed. What is the Bank On Yourself Method? Bank On Yourself uses a little-known super-charged version of an asset that has increased in value during every single market crash and in every period of economic boom and bust for more than 160 years – dividend-paying whole life insurance. Yes, we said whole life… but not the kind most financial advisors and experts like Suze Orman and Dave Ramsey talk about! With this variation, you don’t have to die to “win.” It requires a dividend-paying whole life insurance policy with some features added on to it that maybe one in 1,000 financial advisors understands. A large portion of your premium goes into two riders or options that make your money in the policy grow significantly faster than a traditional whole life policy, while reducing the commission the agent receives by 50-70%. This concept is widely known as “Bank On Yourself,” however, as it has grown in popularity, you may hear it referred to as the 501(k) Plan, the 702(j) plan, the 770 bank account, become your own banker, Infinite Banking®, income for life, invisible bank account or the President’s Account. NOTE: If your policy isn’t structured properly, it could grow much more slowly, lose the tax advantages, or both. Only 200 advisors in the U.S. and Canada have passed the rigorous training and requirements to be a Bank On Yourself Authorized Advisor. They know how to structure these policies right and which companies offer the best policies for maximizing the power of the Bank On Yourself concept. You’ll get a referral to one of these advisors when you request a FREE Analysis here. Enjoy the peace of mind that comes from steady, predictable growth, year in and year out. You’ll always know the minimum guaranteed value of your retirement account on the day you’ll want to tap into it… and at every point along the way. Bypass banks, finance and credit card companies altogether by becoming your own source of financing for cars, vacations, a college education, starting a business and more. Get the money you need when you need it – simply by asking for it. In fact, famous people like Walt Disney, Ray Kroc and J.C. Penney used this method to start or grow their businesses when no bank would lend them a dime. Learn how Bank On Yourself policy loans work. Access the money in your plan – with no taxes or government penalties or restrictions – when you want and for whatever you want.2 (Try doing that with your 401(k) or IRA!) Compare your plan to Bank On Yourself. Best of all, the money you take from your policy – whether you use it for purchases or investments – can continue to grow just as if you never took it out! Caution: Only a handful of companies offer a policy with this feature, so be sure to work with an Authorized Advisor who knows which companies to use. Learn how to find an Authorized Advisor here. Learn how special programs for folks up to age 85 work. Discover the step-by-step process for getting started with Bank On Yourself. Wondering where you’ll find the money to fund a plan? Here are eight ways to do that. Take the $100K Challenge! Bank On Yourself is offering a $100,000 cash reward to the first person who can show they use a different strategy that can match or beat the advantages and guarantees of Bank On Yourself! Find out how you can join the Bank On Yourself Revolution and enjoy real wealth and financial security for as long as you live. Request your free, no-obligation Analysis that will show you how much your financial picture could improve if you add Bank On Yourself to your financial plan. Bank On Yourself founder Pamela Yellen is a financial security expert and author of the New York Times best-seller, The Bank On Yourself Revolution. She investigated over 450 financial products and strategies in her search for an alternative to the risk and volatility of traditional investments. She has appeared on every major TV and radio network, and her articles and interviews have appeared in thousands of publications and websites. Get to know Pamela Yellen.